I got 16 GB USB flash from my brother, because he can't see me still using my old 64 MB. He decided to buy Imation Nano-Flash-Drive. Because of many of my friends and colleagues are using Win, I use NTFS on it. Old FAT is not "usable" in these days, because it can't handle bigger files. 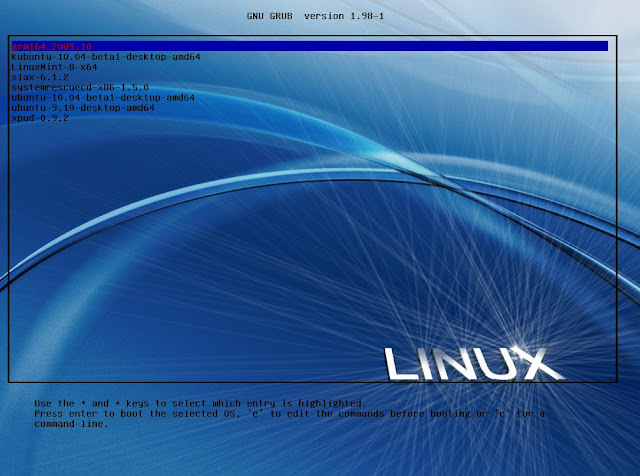 Last step is creating right configuration and downloading live iso images of various Linux distributions. The following code is taken from this web page http://ubuntuforums.org/showthread.php?t=1288604 wgere I added more live cds. I also change the main grup.cfg little bit and use 64 live CDs (amd64). "findiso=" .. isofile .. " apm=power-off quiet boot=live nomce"
" edd=off noapic load_ramdisk=1 prompt_ramdisk=0 rw" ..
"fromiso=" .. isofile .. " boot=fll quiet"
"from=" .. isofile .. " ramdisk_size=6666 root=/dev/ram0 rw"
"boot=casper iso-scan/filename=" .. isofile ..
" quiet splash noprompt" ..
" keyb=" .. langcode ..
" debian-installer/language=" .. langcode ..
" console-setup/layoutcode?=" .. langcode ..
hi, i tried to follow the steps given but keep encountering errors at the make, i'v tried searching the net for like 2 days but dont even come close to find a solution let alone a similar problem. please see below and provide some help if possible. I tried the steps above with grub version 1.98+20100804-2 from debian testing and it's working fine form me. I was able to compile it using the "debian way" mentioned above. In the worst case you can install debian testing into virtual machine and follow the steps above. Install package texinfo (and maybe texi2html?) and it should compile. Do you have the files from this download? could you post that somewhere?